Riley & Cooper are very vocal about their excitement for hunt training with Bryce! Bryce is about a 3 hour drive from us and let me tell you, it is worth it to make that trip! He loves both of my pups and truly understands that each dog has their own hunting style. Riley is more showy and has much more obvious points, but he also appreciates that Cooper is more steadfast in his points and doesn't break as easily. 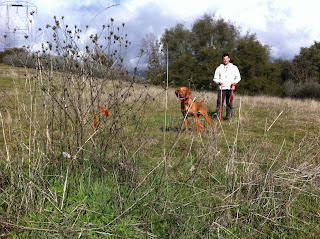 "BRYCE MANN'S GUN DOGS is located in the Sierra Nevada Mountains of Central California in the small town of Tollhouse. Bryce began training dogs 31 years ago. He started with Weimaraners and now currently owns and raises German Shorthaired Pointers and English Pointers. Doug started his hunting adventures as a young boy growing up in the Alaskan frontier. Large game, water fowl and Labradors was the initial introduction to hunting. By moving to the lower 48 States large game has taken a back seat to an intense focus on upland hunting with English Pointers. Bryce currently trains pointing, flushing and retrieving dogs of all varieties for upland game and waterfowl hunting. Over the years his dogs have held many local and state titles. He is currently competing at the national level with his dogs in upland tournament hunting and serves on the national board of directors for North American Gun Dog Association “NAGDA”. Doug has been involved with The North American Gun Dog Association “NAGDA” for many years both serving as a national board member and executive treasurer and for the past 5 years. Competing at the National level has produced multiple Top 10 placements along with local and state titles with other upland organizations. Bryce and Doug have been gun dog handlers for various hunt clubs and provided handling and trained dogs for the California Department of Fish and Game’s Heritage Game Bird Programs Family, Ladies, Junior and wheelchair pheasant hunts. Bryce and Doug also conduct seminars for Bass Pro Shops and groups such as Ducks Unlimited, Quail Unlimited and the California Department of Fish and Game's Advanced Hunter Education programs and the Western States Gun Dog Expo. Both are featured seminar trainer and representative for Tri-Tronics., Remington Sporting Dog and Hi-Viz shooting systems. Bryce and Doug are patron life member of the National Rifle Association. Bryce proudly serves as a member of the NRA Members Council. He also is a Ca.DFG certified hunter safety instructor. Bryce provides specialized training for dog owners who are mobility impaired. He is an advisory member of the California Department of Fish and Game dealing with handicapped access. He is also the current president of California Wheelin’ Sportsmen. Not only is Doug involved with hunting but also volunteers his free time as the President of the Fresno Junior Hockey Association and coaches youth water polo. Bryce has written articles for Gun Dog Magazine, Pointing Dog Journal and Gundogs Unlimited online magazine. He has also has done interviews and articles for Western Outdoor News, Outdoor California Magazine and for TV( Bird Dogs Forever, Turkey Country TV and Comcast Sports along with radio, pod casts, news papers and personal appearances. See the blogs: “A Gun Dogs Life” and www.OutdoorMann.com Doug has contributed articles for JHO and Western Outdoor News Magazine. Bryce and Doug are voting member of the Professional Outdoor Media Association (POMA). Our current list of sponsors includes many prestigious names in the hunting and shooting industry; Tri-Tronics, Canidae, Happy Jack, Danner Boots, Remington Sporting Dog, Poly Wad ammunition, DLR Insurance Solutions, Richesin Ranch, Hi -Viz shooting systems, Pella Products, Natural Gear 5.11 Tactical and Atlas Trap." Bryce is highly esteemed in his field. He trains mainly GSPs, but he has a very soft hand and treats all the dogs with respect. Riley and Cooper get so excited when we pull up to his house for training (as you can see in the video)! I'm looking forward to Riley's full recovery so we can *hopefully* get back to hunting. Only time will tell.